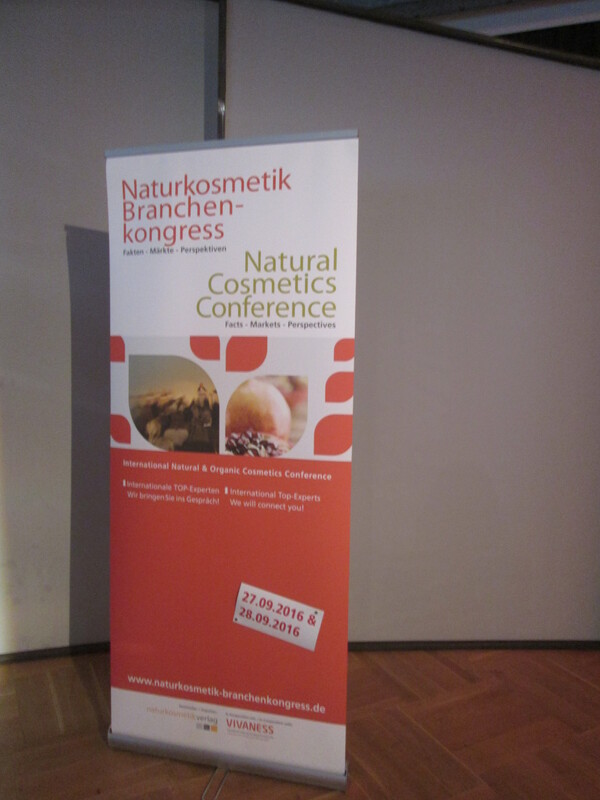 It is that time of year again: the Natural Cosmetics Conference (Naturkosmetikbranchenkongress) was in town this week! It’s an annual event which used to be held in Nuremberg but then moved to Berlin in 2011. And it’s one of my favourite industry events: two days jam-packed with interesting lectures, discussions, forums and presentations plus the chance to meet interesting people. The Conference always offers a good mixture of topics. This year there were presentations on consumer trends, demographics and behavior, on market research and gender marketing, but also on certifications with a particular focus on the much-debated ISO guideline for natural cosmetics and on halal certification. Traditionally the conference starts with a presentation on the German organic industry. Elfriede Dambacher from Naturkosmetikverlag, the organizer of the conference, presented the latest facts and figures, distribution channels, trends and developments. Organic cosmetics are still very successful in Germany, despite the fact that it is a mature and very saturated market. In 2014, turnover of organic C&T reached more than 1bn Euro – this is certified organic C&T, by the way, not “green” or “eco” brands. And for 2015, industry expert expect further double-digit growth. Organic beauty was growing faster than near-natural cosmetics last year and private label brands (which account for a solid 27% market share of the organic beauty market!) are starting to slow down a bit. Vegan is still a big trend and the most important target groups for organic beauty are consumers aged 25-35 and people aged 55+. One of the reasons why organic beauty registered yet another strong year, by the way, were a number of C&T ingredients scares that were splashed all over the German media in 2014 and 2015 – parabens in skin care, silicones in hair care and, most of all, aluminium salts in deodorants. With a market share of 39%, drugstores remained the biggest distribution channel for organic cosmetics; this retail channel grew 15% in the first half of 2015. Organic supermarkets (which account for 15% of the market size) registered a turnover increase of 15% whilst sales in the third biggest channel, Reformhäuser (11% of the market), remained flat. Although perfumeries are one of the smaller distribution channels for organic beauty, this retail channel managed a 47% increase in the first half of this year. Department stores grew 13% and online retailers increased 15%. So far so good! But of course the organic beauty market in Germany is also facing some challenges. It is a saturated market, I mentioned that before; and there is such a wide range of certified organic brands in every retail channel (discounter, supermarket, drugstore, perfumery, department stores) that sometimes consumers find it difficult to distinguishing between the various brands. Consumption of organic cosmetics is also slowly shifting from bricks and mortar stores to online retail. What organic brands can do to overcome these challenges is to create attractive shopping experiences, strengthen the core values of the brand, approach brand marketing with creativity and flexibility and pay attention to their different consumer target groups. Wolfgang Adlwarth from market researcher Gfk spoke about how organic beauty brands these days have to project authenticity but at the same time need to stage a full-on brand experience in order to remain attractive to consumers. This is especially important if you want to appeal to one of the most important target demographics for organic beauty, the “Generation Y” (a marketing term: Generation Y includes people who were born in between 1977 and 1998. Or 1981 to 1996, depending on the source). Adlwarth first gave a quick market overview: every fourth C&T consumer in Germany is buying certified organic products. The retail brands are getting stronger while the own label brands are slowing down – we already talked about this – and drugstores are continuing to grow their market share. While e-commerce still accounts for a very small share of the organic retail market, it is a growing sector: sales of organic beauty through online channels increased 4.4% in 2015. Amongst online purchases skin care was the biggest product category. The Internet is also playing an increasingly important role in organic beauty because this is where consumers do their research and exchange opinions in forums and social media. Unsurprisingly, Generation Y consumers are particularly active online. And of course demographic and societal changes are also changing consumer behavior – the constant self-presentation (especially online – social media, Instagram, Twitter; the usual suspects!) means that consumers perceive and purchase brands differently. Alina Scheinker from Euromonitor presented some fascinating trends in the global beauty market. For example, in a consumer study in Japan beauty users said that they were happy to spend money on locally produced/locally sourced cosmetics. The regional heritage of products is one of the most important considerations for Japanese consumers – this applies to a number of FMCG categories, by the way, but it is especially visible in food and cosmetics. In India, future growth of the C&T Market will be driven by premium products and the Brazilian C&T market is almost entirely dominated by one brand retailer, Natura. In Indonesia, one of the international C&T growth markets, halal cosmetics for young women will be an important market factor. While globally skin care is the biggest product category (followed by hair care and colour cosmetics), Scheinker pointed out three other potential growth sectors: baby and children’s care, perfumes and, interestingly enough, deodorants. In developing countries, consumers often can’t afford fragrances so they use deodorant products instead. Makes sense when you think about it! And the emerging markets to watch are China, India and Indonesia. Ulrich Reinhardt from Hamburg-based future research institute BAT Stiftung für Zukunftsfragen was the key note speaker on the first day of the conference. It was an interesting sociological lecture: Reinhardt says that Germans (as a people) are strongly affected by fear (fear of poverty, fear of the future). Some of this fear is justified, of course; Germany is a hyper-ageing society and in no other European country is the gap between rich and poor wider. According to Reinhardt, more than 90% of Germans (regardless of demographic, age, level of education or income) see this ever widening gap between richness and poverty as the biggest challenge to the German society. That the increasing pace of modern life can be a major stress factor is no secret either – and not surprisingly, when you poll people on what they most desire, the answers tend to be about time: free time, time to do spontaneous things, time to meet up with friends, spending time socially. Reinhardt also mentioned the term “luxese”, a hybrid word created from “luxury” and “asceticism”, meaning that consumers will happily spend a lot of money on certain luxury goods but at the same time they shop at the cheapest discounter supermarket. The result is that the super-cheap brand sector and the premium brands are flourishing; the mid-sized and mid-priced brands, on the other hand, are suffering. This is a development that I’ve been observing in the German retail market for years and it’s a worrying tendency, I think. Mid-sized brands and retailer – SMEs – are the backbone of any retail market. However, there also was some positive news in the sense of consumers changing for the better: looking at the competition between online and offline sales channels, a poll found out that 4 of 5 German consumers would prefer to buy in a bricks and mortar outlet. At the same time, 9 of 10 Germans said that it was important to support local stores and that this is the reason why they prefer to buy locally. There are also presentations on the international organic industry – sort of an international market overview – plus lectures on specific regional markets which vary each year. This time there was great presentation and panel on the GSA region (Germany, Austria and Switzerland – they might share the same language (or derivations thereof!) but the market structures, consumers profiles and demographics of these three markets are very different. First of all, there is the size: Germany has some 81 million inhabitants. Austria and Switzerland have less than 9 million each. As the biggest economy in Europe, Germany rather tends to dominate the European retail market. Also, we have some very strong discounter chains which between them are keeping prices at rock-bottom: Aldi and Lidl are both from Germany. In Switzerland the demand for organic products is definitely growing. However, at around 4% of the C&T market (in Germany, certified organic cosmetics account for 8-9% of the personal care market) the Swiss organic market is less well developed than in Germany. Also, Switzerland has very high retail prices. As a result, Swiss consumers often go across the border into Germany to shop – the French do this as well, by the way (Germany shares borders with nine countries including Switzerland, Austria and France). Shopping tourism (from Switzerland to Germany) is a major drain on the Swiss economy and it is estimated that some 9-11bn Swiss francs (or some such amount) are spent in Germany. This figure came from one of the podium speakers, Verena Eggert from Swiss retail group Migros. The Swiss retail market is also interesting because they don’t really have a drugstore channel like we do in Germany. German drug store chain Müller has some stores in the German parts of Switzerland but other than that, cosmetics are sold in supermarkets (and in Switzerland, you basically have just two supermarket chains, market leader Migros and Coop). However, in Switzerland you’ll find Drogerien, a type of drugstore that has pretty much died out in Germany. These Drogerien sell beauty products but also premium fragrances, OTC products, some natural foods, household cleansers, some chemical substances and a whole lot of other product categories. In Austria, on the other hand, you do have German-style drugstore chains and it’s a popular distribution channel for personal care, including organic cosmetics. The two German drugstore retailers DM and Müller have a dense store network in Austria which means that their respective organic own label brands – especially DM’s Alverde – also have a strong market position. However, one of the bigger Austrian drugstore chains, Bipa, recently launched its own certified own label brand bi good so there is now some local own label competition. Migros has a certified organic own label brand which is called “I am natural” and was launched in 2009. Competitor Coop also has an organic beauty brand, Naturaline. However, compared to DM’s Alverde – which is the European bench-mark as far as organic own label brands are concerned – bi good, I am natural and Naturaline only have a small product portfolio. But at least these labels do exist – and in Germany at least, the presence of affordable organic own label brands (most notably Alverde) significantly contributed to bringing organic C&T into the mainstream retail market. Eventually, Austria and Switzerland will see a similar development. Organic certifications always play a big role at Branchenkongress – as you might know, Europe has a very wide range of organic certifications. The biggest labels over here include BDIH and Demeter (Germany), NaTrue (pan-European), Ecocert (international/France), Cosmebio (France), Soil Association (UK) and ICEA (Italy). In 2002, BDIH, Cosmebio, Soil Association, Ecocert and ICEA banded together to introduce a harmonized standard: COSMOS. COSMOS embraces two categories, Organic and Natural. Negotiations were long and thorny and the COSMOS standard is still a bit of a new kid on the block. Unsurprisingly, there is a good bit of label confusion amongst consumers: all of these certification standards share similar regulations. One certifying body might allow an ingredient that another association forbids but in general, the European seals are very strict. Especially when compared to international organic certification associations. And don’t even get me started on the many pseudo-natural “green” labels that have appeared on the market in recent years! To make things even more complicated, a new ISO guideline (ISO is the International Standard Organisation) on natural and organic cosmetics is currently under development. This was started in 2009 and they are still not closer to a consensus. Which is a good thing in my opinion. Basically, this ISO guideline is supposed to offer one single international standard – sort of a lowest common denominator. This means, of course, that all international interpretations of what constitutes natural and organic need to be taken into consideration: from the very strict European organics definition to the rather relaxed approach they have in other parts of the world. The new ISO guideline and the controversy that surrounds this issue was one of the major focus areas at this year’s Branchenkongress – we had a really interesting panel discussion on this topic on the second day. Another fascinating topic is halal certification. For obvious reasons halal cosmetics are an established part of the food and cosmetics markets in any Muslim country but Western C&T manufacturers are only now starting to realise that this certification is becoming increasingly important. It is estimated that the global halal beauty market is worth 2-3bn USD. It’s a desirable market both for retail cosmetics (i.e. finished products) and for cosmetics ingredients suppliers who often export their fragrances, ingredients or extracts into markets across the world, including South East Asia, Africa and the Middle East. However, halal certifications can also be very difficult: it’s immensely complex field and the market paramets are constantly changing. For example, there is only one real written halal standard, and that is in Malaysia. If I understood it correctly, the Malaysian standard is considered to be a bit of a bench-mark. To certify a product as halal the entire production chain (from ingredients over product manufacturing to assembly and shipping) needs to be free of certain ingredients. The speaker, Farhan Tufail from Halal Certification Services in Switzerland, said that in Malaysia they even have a halal standard for the transport of products! As far as cosmetics are concerned, the most important ingredients that cannot be used in halal products are alcohol and ingredients derived from dead animals, like carmine (often contained in lipstick) or panthenol (used in skin and hair care). Unfortunately ethanol alcohol is a very common ingredient in most conventional and organic cosmetics. Organic brands face an additional challenge in this respect since they often use larger amounts of alcohol as a preservative – synthetic preservatives are not allowed in certified organic beauty products. This can make halal certification difficult. To complicate the matter further there is no religious body or association that supervises halal standards. The regulations for halal products come directly from the Koran. And each halal certification body – there are about 40 major international halal certifying associations – interprets the halal laws differently. Many Muslim countries have different regulations as to what is halal and what isn’t. Malaysia, for example, allows an alcohol percentage of 0.5% in a halal product. More conservative countries like Iran or Saudi-Arabia, on the other hand, insist that halal products contain no alcohol whatsoever. So even if a product is certified for the Malaysia market, the same product could not be retailed in Saudi-Arabia. In some countries you have regional governments who hold different opinions on percentages so even within a regional market, the certifications can look different. Which doesn’t make things any easier! The key note speaker on the second day was Christoph Engl from consultancy Brand Trust. Engl talked about how the new currency in brand marketing and brand communications is relevance and attention. Today’s consumer has a bigger choice of brands than ever before. All of these brands bombard their target demographics with brand messages, marketing strategies and visuals so we are subjected to a continuous flood of messages – and very adept at tuning them out. This means that a brand has to stand out from its competitors if they want to draw the attention of their target demographic. These days we have also developed new business models, a new approach to goods and services – lending a car instead of buying one, for example; leasing a software application instead of purchasing it: if you need something, you borrow it, trade for it or lease it. Consumers are saturated and markets are saturated – and how do you handle a market situation like this if you are, say, a beauty brand? One strategy is to focus attention on the underlying principles of a brand. Engl used the simile of an iceberg: the tip of the berg is above the waterline – this is where brands traditionally focus their marketing efforts, investing into the style of the brand, into communication, design and PR. Instead, what is almost more important is what’s hidden underneath: the architecture of the brand, its contact points, the brand core, the fan perception. Consumers need to believe in a brand for a brand to be successful. It must be very clear on what it offers and what it doesn’t offer, creating a distinctive profile. There are four types of brand categories (Engl used a type of diagram to illustrate this): In the “no brand” category consumers neither know the brand nor care about it (i.e. they are unwilling to spend money on it!). Then you have the “in brand” sector: this is a little known brand with a high level of attractivity (like niche brands with their low volume sales and large value turnover!). Then there are the “star brands” (everyone knows this brand and everyone wants to buy it) and finally, the “out brand”: it might well be famous but has become marginal since it has little appeal. Overall it was a great conference experience: thank you Branchenkongress! The next Natural Cosmetics Conference will take place on 27th and 28th September 2016.